David, I agree with you on this 100%! It’s an argument I’ve been having at the ICTY/ICTR and elsewhere for years! But I’d go a step further – I don’t think the iCTY or ICTR should prosecute individuals unless it is alleged that the crimes were state-sponsored. If not, then they are not crimes of international concern and their respective states can be trusted to prosecute those crimes. Not an original thought, I know, and best developed by Professor Rafaelle Maison in her doctoral thesis. But moral equivalence at the ICTY drove me crazy. Oric is put on the same pedestal as Mladic, though Oric was fighting to prevent the very genocide that happened in July 1995. 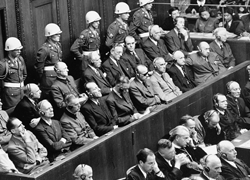 It’s as if Nuremberg had put Warsaw ghetto fighters on trial alongside Goering and Goebbels. John raises a good point above about the idea of state action being a requirement for an international prosecution. The problem about such a bright line requirement is that some commission of mass atrocity are committed by organizations with state-like qualities but arguably not states themselves. Al Shabaab in Somalia, for example, in my view has committed crimes against humanity but may be considered not to be a state actor. It has controlled some parts of Somalia at times, but at other times it has not. The ICC has several criteria that more or less create such as threshold but with some flexibility. Crimes against humanity must be committed as part of a state or “organizational” policy. War crimes require either a plan or policy or large scale commission of offenses. Both categories of crimes have a gravity element and a plan or policy element.